Introduced in 1932, the Talbot 65 was engineered by the brilliant Georges Roesch. Built around a sturdy yet nimble ladder frame chassis equipped with leaf-sprung suspension and four-wheel drum brakes, it was powered by a highly efficient 1665cc OHV straight-six engine. Compared favourably with the Rolls-Royce 20/25hp by the contemporary motoring press, many examples (including this one) boasted the extra refinement of four-speed pre-selector transmission. 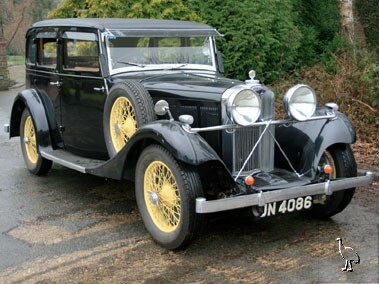 Supplied new to John Pugh by Pollards Garages of Leigh-on-Sea, the Talbot was first registered as 'JN 4086' on 29th March 1934. A tailor by profession, he kept the handsome Darracq-bodied 6-light saloon for over three decades before passing it to relation Leslie Pugh during August 1967. In the latter's custody until the late 1980s, the 65 spent most of that time in dry storage following an engine failure incurred whilst on a Scottish expedition. Extremely original and well preserved in many respects, the Talbot was nevertheless subjected to an extensive restoration by its next owner. Finished in black with contrasting yellow painted wire wheels, the well-appointed saloon pleasingly retains its original brown leather upholstery (save for the recently but sympathetically re-trimmed driver's seat), wood veneers, supplier / coachbuilder plaques, rear window blind and cut glass interior light. Sporting a Weathershields sliding head roof, Boyce Motometer and imposing Rotax headlamps, 'JN 4086' entered the current ownership - that of a motoring author and member of the Society of Automotive Historians - via our October 2005 Syon Park auction. As well as participating in the 2006 Brooklands Society Reunion and being invited to the following year's Brooklands Double Twelve meeting, we are informed that the last five years have seen the Talbot used for "gentle touring and Vintage Sports Car Club Winter Driving Tests". Further understood to have had "work done by Arthur Archer" and to benefit from the addition of modern flashing indicators to augment and compliment the period trafficators (a common sense modification for ease of use in today's traffic), 'JN 4086' is apparently one of just six 65's known to have survived with Darracq 6-light coachwork. Described by the vendor as being in "very good" condition with regard to its engine, pre-selector transmission, electrical equipment, interior trim, coachwork and paintwork, the Talbot is only being offered for sale due to a change of circumstances. A delightful Post Vintage Thoroughbred, its engaging history file contains a copy of the Pollards sales invoice, old logbooks, bills / MOTs dating back to the 1960s, assorted 'barn find' / restoration photos and MOT certificate valid until October 2010.